Coix L., Sp. Pl. 2: 972. 1753. Annuals or perennials, monoecious; culms solid. Leaves wide, with or without tubercle-based hairs. Inflorescence apparently consisting of 2 spike-like racemes, one of 3 spikelets, the other of a number of staminate spikelets. Pistillate spikelet ovate, acuminate, swollen, lower glume equaling the spikelet, thin, many-nerved; upper glume and lemmas gradually smaller, ovate, acuminate; lower lemma 3-nerved; lower palea wanting; upper lemma 3-nerved; upper palea smaller, 2-nerved; stamens reduced to 3 small staminodes or totally suppressed; styles 2, connate at v base, free above, but cohering, exserted through apical pore of utricle; the stigmas diverging. Caryopsis furrowed on ventral side: Staminate raceme usually nodding, rachis articulate; spikelets in alternate pairs or triads; peduncle of raceme remaining inside spathe, the body of the raceme exserted through apical pore, pairs and triads consisting of 1 and 2 pedicelled spikelets respectively, and of 1 sessile spikelet; spikelets dorsiventrally arranged, spikelets dorsally compressed, obovate, 2-flowered or lower flower not fully developed; glumes herbaceous, as long as spikelet, many-nerved, the lower glume winged; lemmas thinly membranous, 3-nerved, paleate and with 3 stamens. or lower lemma without stamens; lodicules usually cuneate and small. About five species distributed in tropical Asia;. 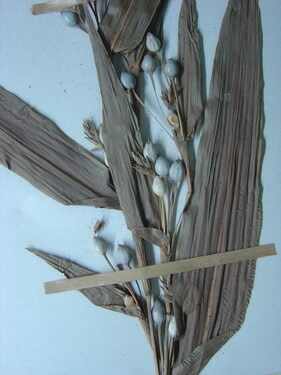 one species with three varieties are cultivated for food and medicine in Taiwan.